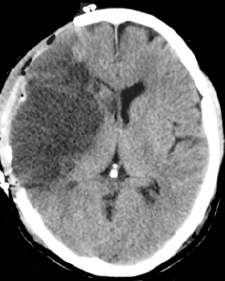 Malignant MCA syndrome may be seen following a large MCA territory infarct. It usually occurs 2-5 days post onset of stroke but sometime can occur earlier within 24 hrs. There is localised cytotoxic oedema, swelling and often midline shift. Trials have shown that surgery both reduces mortality and improves functional status but also results in the survival of more patients with severe disability. 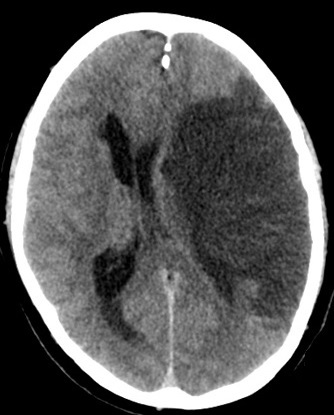 CT scan initially may be normal or show a hyperdense artery. Overtime there is progressive hypodensity and obvious cytotoxic oedema and midline shift. Even with ICP management with endotracheal intubation, blood pressure control, osmotherapy, hyperventilation, and barbiturate anaesthesia for refractory intracranial hypertension, mortality rates of up to 80% have been reported. Decompressive hemicraniectomy with durotomy involves the removal of a large flap of bone and the layer of dura that lies over the brain. The brain can herniate beyond the confines of the skull. The result is that brainstem compression is less likely, and survival increased. Patient selection will depend upon the patient's known views and wishes as to how they would wish to be managed. A poor functional baseline with significant co morbidities may suggest surgery is not in the patient’s best interests. Involvement of the PCA and/or ACA on imaging would suggest a poorer outcome. AN infarct volume > 145 cm on DWI is also associated with poorer outcomes. Surgical decompression for space-occupying cerebral infarction (the Hemicraniectomy After Middle Cerebral Artery infarction with Life-threatening Edema Trial [HAMLET]): a multicentre, open, randomised trial Lancet Neurol. 2009 Apr;8(4):326-33 HAMLET investigators Surgical decompression reduces case fatality and poor outcome in patients with space-occupying infarctions who are treated within 48 h of stroke onset. There is no evidence that this operation improves functional outcome when it is delayed for up to 96 h after stroke onset. The decision to perform the operation should depend on the emphasis patients and relatives attribute to survival and dependency. Decompressive Surgery for the Treatment of Malignant Infarction of the Middle Cerebral Artery (DESTINY) Stroke 2007;38:2518-2525 DESTINY Study Group DESTINY showed that hemicraniectomy reduces mortality in large hemispheric stroke. With 32 patients included, the primary end point failed to demonstrate statistical superiority of hemicraniectomy, and the projected sample size was calculated to 188 patients. Despite this failure to meet the primary end point, the steering committee decided to terminate the trial in light of the results of the joint analysis of the 3 European hemicraniectomy trials.